Recipe of the day is Jacket Potatoes with Parma Ham, crumbled Beacon Fell Traditional Lancashire Cheese, Roasted Root Veg and Paprika Soured Cream. This brilliant potatoes recipe serves 4 people. Rinse and prick potatoes, pat dry and rub in olive oil, salt, pepper and a little smoked paprika. Place on a baking tray and roast for around one hour, until cooked. Meanwhile, toss the vegetables in a little olive oil and season well. Cook for the remaining 25 minutes of the potato cooking time. Mix together the soured cream and ½ tsp smoked paprika. 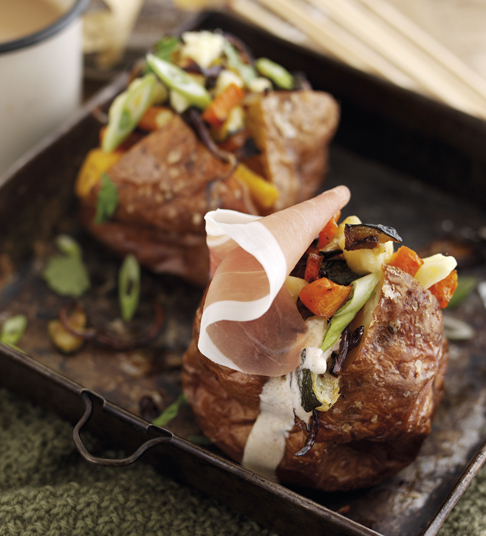 Split the potatoes open, top with plenty of root vegetables, soured cream, Lancashire cheese, spring onions, coriander and finish with Parma Ham. Previous Oral Health – Going back to Basics.